Gionee is definitely keeping busy lately. Only a few days ago the company unveiled the M7 and M7 Power and a recent TENAA filing suggest a third budget-oriented 18:9 device is on the way as well. Well, now we can bump the count with at least one more handset - the Gionee S11, which recently showed up on the Chinese certification authority's website as well. It seems Gionee has really taken the ultra-wide aspect ration trend to heart, since the S11 is listed as using a 6.01-inch, 1080 x 2160 pixel AMOLED panel. Likely the very same FullVision one used in the M7. You definitely won't hear us complaining, since it has all the right signs to really impress. At least on paper, that is. TENAA also shares the unit they received runs on a 2.5GHz octa-core chipset, coupled with 6GB of RAM and 64GB of storage. 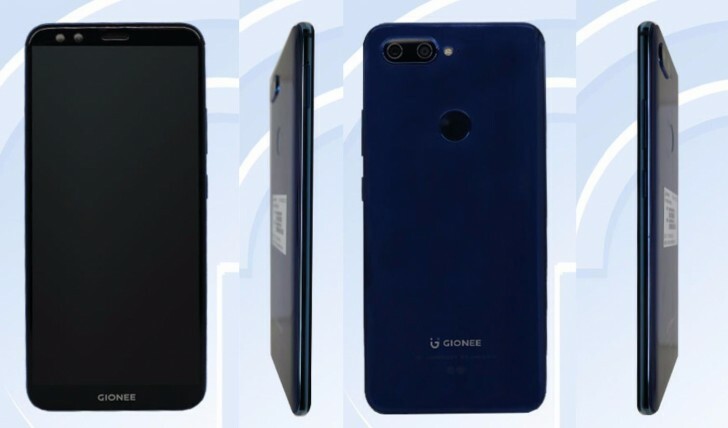 Taking after its S10 predecessor, the Gionee S11 will also have a total of four cameras - two on the back and two on the front. By the looks of things, the setup won't really be changed and will consist of 16 MP + 8 MP on one side and 20MP + 8MP on the other, respectively. According to TENAA, this is all crammed into a body, measuring 155.8 x 72.6 x 6.95mm and weighing in at 178 grams. This includes a sealed-in 3,600 mAh battery. Other mentioned specs are a fingerprint reader on the back and an Android 7.1.1 Nougat-based OS. 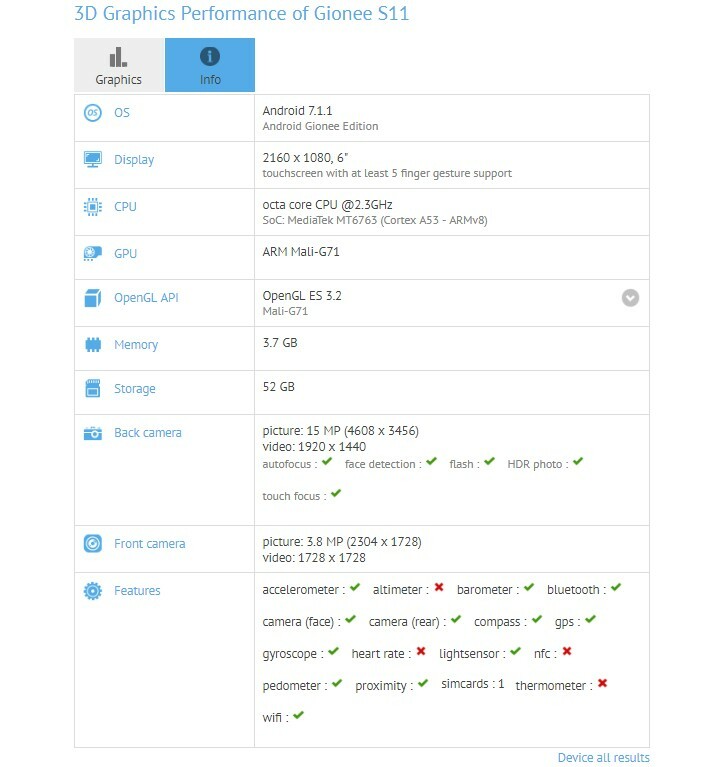 Interestingly enough, a device with the Gionee S11 moniker popped-up on GFXBench recently as well. The benchmark also reports a 6-inch, 1080 x 2160 pixel display and a 16MP main camera - so far, so good. However, other details don't really match up, like the quad-core MediaTek MT6763 chipset, 4GB of RAM and 4MP selfie cam. Since the S10 does have two other variants, we can expect to see the same from the S11, which could explain the mismatch. Here's hoping we get some official info from Gionee soon. That logo on the front is awful. Why didn't they follow the trend of removing the front logo too? I'm liking the OLED and battery though. After two years lets laugh at your comment.